In September 2013, epic flooding in Colorado overran 50,000 oil wells and swept away dozens of condensation tanks that hold chemically laden waste from fracking. This environmental disaster has created a health care crisis of yet undetermined proportions. Colorado’s lax regulations don’t require that drillers release the names of chemicals used in fracking fluid but it known that they are linked to diseases and medical conditions that include cancers, infertility, ADHD, autism, diabetes and thyroid disorders and that chronic illnesses from exposure to these chemicals can take many years to manifest. We are seeing that the gas industry is not immune from the destruction that its activities have helped to create. The Catskills has experienced unprecedented flooding in the last five years and it is expected that major flooding caused by the current cycle of global climate change will continue. This could lead to catastrophe if fracking is approved in New York State because the danger of toxins from fracking wastewater getting into our water supply from floodwaters is especially acute. Fracking wastewater not only contains the toxic and hazardous chemicals used in fracking fluid but also contains contaminants that it picks up from deep within the earth, most notably salty brine and radioactive materials. The documented health consequences of exposure to these toxins include increased rates of asthma, infertility, ADHD, autism, diabetes, thyroid disorders, brain disorders and many types of cancer. The New York State Department of Environmental Conservation (DEC) has put window dressing in their revised regulations that they say will address the problem of the dangers of flooding. In their most recent September 2011 draft they propose to ban well pad development in 100-year floodplains. But there is a critical catch. The DEC has admitted that their flood maps are out of date and have been unreliable in the past. 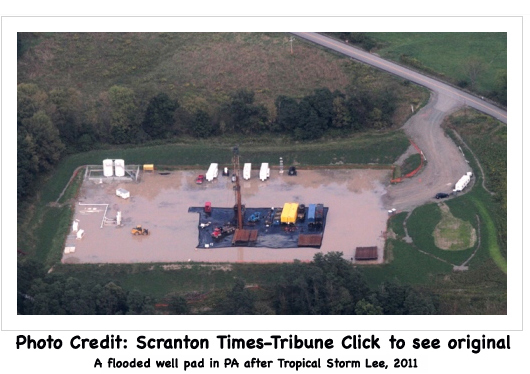 Floodwaters could overwhelm drill sites and holding ponds and carry fracking waste into streams that eventually end up in the Delaware and Susquehanna rivers. Flooded river systems could force waters to flow back into treatment plants resulting in untreated wastewater being dumped into rivers. Overweight trucks that carry hazardous fracking chemicals could further damage already flooded roads, increasing accidents. The potential for well sites, drilling infrastructure and holding ponds to flood is an unacceptable risk. This is one more reason why based on extensive study and scientific evidence, Catskill Mountainkeeper has called for a ban on fracking. We are also working within the existing regulatory process in New York to raise critical issues, widen the discussion of the impacts of drilling, and expand the options available to protect the public.